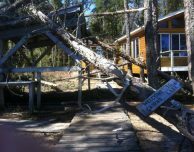 Last October, an early winter storm came through the area, dumping 12 inches of snow on us and pummeling the cabins and trees with heavy winds. When Buster and Cody went out to Cairns Lake, they discovered that several trees had fallen down. There were even trees that had fallen on the cabin, but luckily it didn’t suffer any damage. Unfortunately, the dock and the cook were a bit disheveled. The dock had been ripped out, and three fallen trees damaged the solar system and the cook area. Dave and his brother, Ray, went up and welded the dock back together. Buster and Cody cleaned up all of the trees. And on our way back from finishing updates at the Malette outpost, we stopped at Cairns so the carpenters could fix up the outdoor area. We’re happy to report that Cairns Lake is now as good as new and ready to host more adventurers!